French rabbi; born at Sultz, Alsace, July 17, 1848. He received his education at the lyceum at Strasburg and at the Jewish Seminary in Paris. During the Prussian siege of Paris (1870-71) he served as assistant chaplain. In 1873 he was employed in the office of the Alliance Israélite Universelle. Two years later he was elected rabbi at Remiremont; in 1878 he was appointed chief rabbi of Oran; in 1882 he became chief rabbi of Algiers; and in 1890 was appointed to the chief rabbinate of Nancy, which position he still (1902) holds. 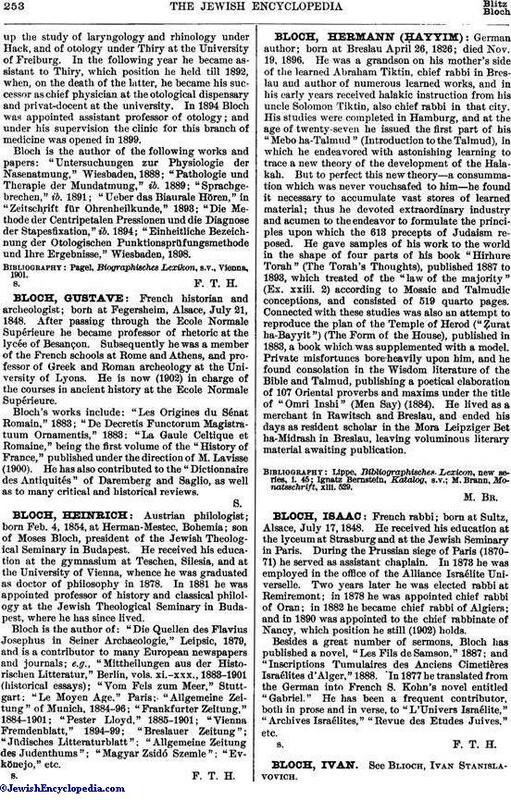 Besides a great number of sermons, Bloch has published a novel, "Les Fils de Samson," 1887; and "Inscriptions Tumulaires des Anciens Cimetières Israélites d'Alger," 1888. In 1877 he translated from the German into French S. Kohn's novel entitled "Gabriel." He has been a frequent contributor, both in prose and in verse, to "L'Univers Israélite," "Archives Israélites," "Revue des Etudes Juives," etc.